This post leverages thoughts and insights from Aviral Gupta an ex-Amazon Product & Vendor Manager. He spent 6 years at Amazon in various product and vendor manager growth roles. He’s passionate about the world of eCommerce and what it takes for Brands and Agencies to be successful on Amazon. Read below on his thoughts and how Insight Leap makes it a reality. InsightLeap wants to make it easy for you to keep an active check on the health of your products on Amazon.com. This assures you stay competitive and provide a stellar customer experience, obsessing over all the details possible! With our product monitoring service, you can choose to receive email alerts on a daily basis (and weekly digest) at an account level. 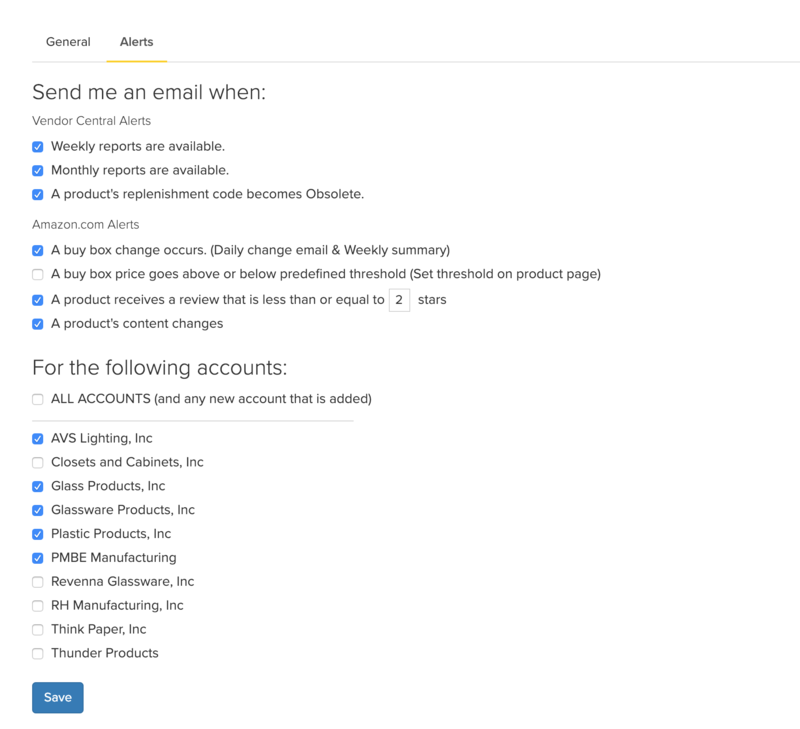 For example, if you have 4 accounts on Insight Leap and two account manager (AM) overlooking those account, each AM can setup the alerts at an account level to stay sharp on product details which matter to their day-to-day. Amazon.com Alerts – Never miss a beat, stay competitive! We built our alerts focused on keeping you competitive and staying sharp in the marketplace with a deep pulse on customer feedback. We have two alerts focused on ‘Buy Box’ activity and two for customer review/detail page changes. As a vendor on Amazon you are probably aware that on Amazon winning the buy box is critical. A product (ASIN) could have one or multiple offers and based on numerous (secret) variables, Amazon decides the best offer that ‘wins’ the buy box. The ‘selling price’ is a huge factor in winning the buy box but there are other variables such as delivery promise, availability etc. With that said, Insight Leap provides you an easy way to know if you are winning the buy box and if the buy box price goes above or below a predefined threshold. For each product being monitored, we check on a daily basis if your offer is winning the buy box or not. If for some reason you lose the buy box, we inform you of the winning offer, availability messaging and buy box price. We provide you a sense of financial importance of the ASIN by including your last week ‘Shipped COGS’ of the ASIN in question. To assist in quick decision making, there are direct links to the product page on Amazon.com and sales & price history of the product on Insight Leap. All of this is summarized at the account level. Subscribing to Lost Buy Box (LBB) alert provides a proactive way to check if your offer is winning the buy box and if not, take quick corrective actions. Losing a buy box could mean thousands of dollars of lost sales with inventory aging. To make matters worse, another offer (vendor/seller) is now gaining market share, yikes! This factor alone (if left unchecked) could tank your sales and dry down future POs. Being informed of the problem is step 1 in solving the issue. The LBB alert provides ease of mind and a way to take corrective action ASAP. In an extension of Buy Box monitoring, you can setup low/high selling price threshold and be notified if the winning offer breaches the threshold. As a vendor with 1P relationship, you do not control selling price and internally at Amazon multiple factors lead to price fluctuations. It’s prudent to keep an active watch on such fluctuations to understand ‘true’ selling price (avg. over a period). Additionally, this is a proactive way to make sure your product is not being hijacked by another vendor/seller by a low ball price (leading sign for counterfeit, or unauthorized reselling) For example, for ASIN FOO you believe the ideal selling price should be $150 which is aligned to other marketplaces. So, you want to keep an eye on that. You might setup a low price threshold $135 (10% below) and high price of $165 (10% above). In this scenario, we will inform you anytime the buy box price goes below $135 or above $165, a quick and easy way to keep check on buy box price. In addition to staying competitive, we want your products stay sharp and assist in keeping a pulse on customer feedback. The number one factor influencing customer purchase decision on Amazon are reviews! Products with low/bad reviews deter potential customer from clicking on the ASIN, hence you might see a lot of glance views but no page views i.e. showed up on search but low click through. Overtime, this will lead to low sales since the product will slowly be de-prioritized in search result placement i.e. the page number it shows up when customers search for it. Keep in mind, on Amazon, all products start from the last row and earn their right to make it to the front. You don’t want anything, especially low unchecked reviews to deter your product’s ability to make it to the front of the search results. Aside from financial impact of low/bad reviews, customer feedback is very important to make changes to the product’s value prop i.e. packaging, instructions etc. Note: Amazon has programs (vine) where you can be proactive on soliciting such feedback. It’s worth noting that a product which does well in a brick & mortar store might not do well online due to the ‘inability to touch/feel’ dynamics of the e-commerce channel. For example, a customer has no way to review your detailed description on the product if it’s only on the product packaging and not on the detail page. Hence, obsessing over your e-commerce customer and making adjustments for the channel specifically based on customer feedback is paramount. Insight Leap has notifications tied to providing you near real time ASIN ratings/review on the product and also any detail page content changes. We provide you a daily feed into latest customer product review/ratings including review title, content and the overall star rating. This is coupled with quick links to directly respond to your customers on Amazon and product review history on Insight Leap. We give you an ability to setup rule on the ‘review star rating’ threshold that you want to be informed about; this could be based on the current baseline of the product’s overall rating and/or your personal preference. For example, you could say inform me when the product receives a review that is 3 star or less. We truly believe in Amazon’s principle of ‘customer obsession’ and there is no other metric more important than customer review/ratings that allows you to react and adjust your product than reviews. The detail page is like a ‘silent salesperson’ for your product. Unlike, a brick & mortar store where a customer can touch/feel the product and then flag a salesperson for further questions; on Amazon you have the detail page to see pictures, read details on the product and then Questions/Answers and Reviews to make an informed decision. As part of new product setup (NIS), you arm and decorate the product page but as the ASIN goes through its lifecycle, there are multiple reasons as to why the content of the detail page could change. Not only that, the detail page is shared across all the offers on the ASIN. So, it could be that somehow another vendor/seller updated the page with information which might not be accurate or stale. You want to be informed right away and take corrective actions. We at Insight Leap want you not caught by surprise and always be informed of the content changes. Hence, as part of monitoring we keep an eye on the ASIN detail page and inform you anytime any change happens. Overall, we realize running an Amazon business is not easy! There are tons of acronyms, technologies, numerous moving parts and a lot of things can change without notice and/or break. Putting mechanisms in place to be informed when such changes happen is a way to make sure you are one-step ahead of your competition; allowing you to focus on growing the business, driving more sales and winning more/bigger POs. Notification alerts is one way to make that happen. All the notifications alerts are tied to ‘input’ metrics, which fuel ‘output’ i.e. sales and POs. This is a classic Amazon way to look at world!